An extremely desirable location near the major tourism area makes the Villa Patriot Hotel Marianske Lazne a good choice for many types of guests. It is within walking distance of the surrounding forests and parks, and is also convenient to many of the more well-known springs and spas. The Spa Colonnade, Singing Fountain, Goethe and Muse sculpture, and Caroline's Spring are just an easy walk from the grounds. The Miniaturepark, Cableway, Fridrichstejn and Ferdinand's Spring and bottling company are also within easy reach as well. The Villa Patriot Hotel Marianske Lazne is located at Dusikova 62, and is 19.2 miles from the Karlovy Vary International Airport. All 14 of the bedrooms in the Villa Patriot Hotel Marianske Lazne are outfitted with luxurious furnishings and décor, direct dial phone service, TV service, high-speed Internet access, separate lounge and sleeping areas, and a full-sized bathroom with spa tub. 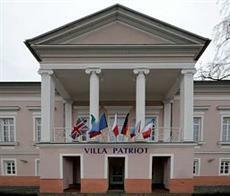 Visitors to the Villa Patriot Hotel Marianske Lazne will be able to rely on the many amenities which include the lovely scenic terrace, the free daily breakfast service, pet friendly policies, an in-house restaurant, a lounge with bar service, and free parking on the premises.